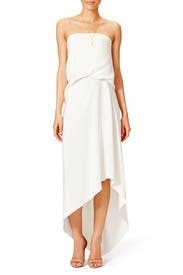 A flowy, asymmetrical hemline gives this Cedric Charlier dress a whimsical touch. Polish off the look with a strappy black heel, Elizabeth & James Accessories' Logan Pendant Necklace, and a bold red lip. Sized: 38-46, Italian sizing. One length available. Regular measures 37” from bust to shortest part of hemline. 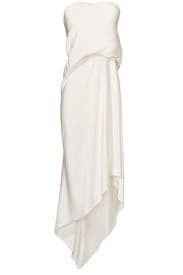 White silk crepe (100% silk). Strapless. Straight neckline. Full skirt. Blouson bodice. Tea length. Hidden back zipper with hook-and-eye closure. Partially lined. Bonded bodice. 37” from bust to shortest part of hemline. Made in Italy. Wow. This dress is truly stunning. I have a large bust compared to the rest of me (36D) so I could not fully close all of the hooks on the built in bra but it still looked great. Order a size up if you have a large bust. This was not my first choice for my rehearsal dinner but RTR sent it as a replacement and it ended up working out very well. Very pretty dress but completely see through bottom. I couldn't come up with the proper undergarments to wear it for what I intended so I used a back up dress. The silk also wrinkles easily. Good for a date night or summery event. I rented this for a black tie Halloween masquerade ball in NYC (hence the mask). 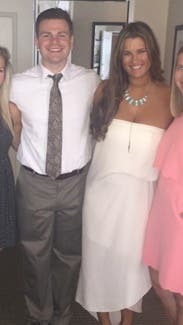 Since it wasn't a wedding, it was a great opportunity to wear a white dress and this one was beautiful. The material and draping of the dress are both very elegant and classy and the length was perfect for a petite woman like me - long enough to be formal but not so long that I had to wear 5" heels (I wore 3" silver and gold pumps). Not sure how the top would work for a bustier woman but it was great for me with no bra - just stick ons. Highly recommend! Wore this dress on vacation to a formal dinner. The dress is beautiful. I am normally a 0 /2. I thought a 38 would be perfect but I could not fasten the inside "corset style" top that is built inside of the dress. The 40 was perfect. Received many compliments. Great Experience! Runs very small and narrow. The lining underneath felt a full size smaller than the dress itself. I received many compliments wearing this dress! This dress looks beautiful, stylish and unique. The silk is really high quality. Loved this dress! Perfect for a summer party and would rent again. 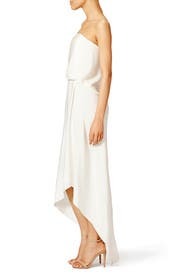 This is a great dress and perfect for a summer party. It wasn't a pure white but more of off-white. Overall, the material is thick enough that I didn't have to worry about it being see through. The material of the dress and the cut makes it feel high end. 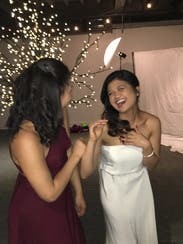 I rented this dress for my bridal shower and it was a hit! The 44R was too tight on my chest, so I went with the 46R. The dress has a built in corset that gives the dress shape. The only drawback to the dress is that the liner wrinkles easily and bunches up, exposing spanks (if you're wearing them!). Otherwise I highly recommend this dress, especially if you won't be sitting a bunch! I had to pin the dress for the event--it doesn't taper at the waist like it shows in the picture on the website. When unpinned, it looked like I had just wrapped a sheet around myself. Other than that, it was a pretty dress and I got a lot of compliments throughout the night. The fabric was high quality and really adds to the elegance.